As a coach, you’ve got to be able to make adjustments on the fly, adapting to whatever new situations present themselves each game. One of the first adjustments many opposing coaches will make, once your high octane offense starts to put up buckets, is to switch to a zone defense. 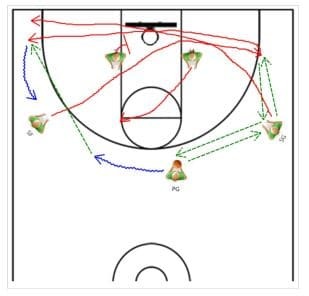 This can be a coach’s worst nightmare, as plenty of players will take this as an invitation to jack up threes with no discrimination, crippling your offensive balance and most likely production as well. And while some man to man offenses may still work against the zone with some small adjustments, your best bet is to have a zone offense in your back pocket that you can pull out whenever you need to. Whether it’s a 3-2, 2-3, or a 1-3-1, the overload is great because it applies the same concept to all three defenses – put more offensive players on one side of the court than there are in the zone! Start off with an unbalanced set, with the center on the left block, the small forward on the left wing, the power forward up top on the foul lane, and your shooting guard on the right block. Your point will be up top with the ball in his hands, and will initiate the play by running a pick and roll going left with the 4 man. However he won’t be looking to attack the paint here, instead opting to swing to the small forward, before drifting back to his original position. In the meantime, your shooting guard will be using a center screen to get open in the left corner, all while the power forward rolls to the hoop. In a traditional 3 out 2 in setup, the zone offense focuses on crisp ball movement to get the zone shifting back and forth until either an open short or driving lane presents itself. When the 1 passes the ball to a wing, the opposite wing will cut through the key all the way to the strong side corner, who will then receive the pass, fire it right back, and then sprint back to the other side of the court again, this time using the center’s screen to get open. The point guard, who will receive the ball back up top, will dribble across the court to give himself an easier passing angle, and then hit the player off the screen, while the power forward will flash to the high post. Once the ball has been moved across the court, the wing player will dribble up higher to create space on the baseline, for the other wing player, who will sprint to that same spot, using the center’s screen once again. Coaches: Are you looking for more offensive tips? 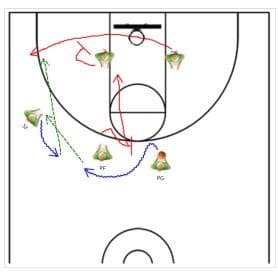 Check out our complete archive of basketball plays, including tutorials for Zone Offense, 1-4 Offense, 5 Out Offense, and Inbounds Plays.